As my daughter has only just turned 2, I thought it would be a few years yet before she was old enough to experience going to the theatre. 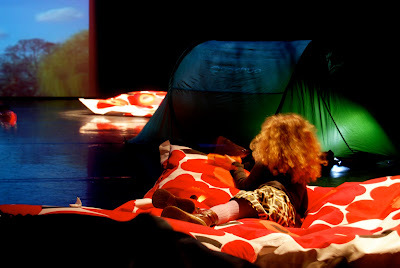 After all, what 2 year old could sit still enough to enjoy any kind of performance? Well, today at The Tobacco Factory Theatre in Bristol, we experienced a unique performance that was perfect for my active and inquisitive toddler, and mostly because sitting still was definitely not on the agenda! 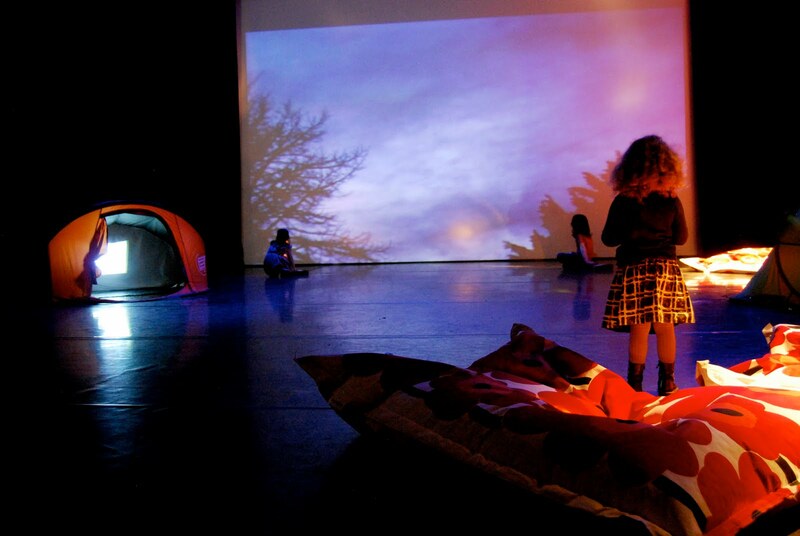 As part of the World Stage Festival, Rachel Davies Film Ltd presented ‘The Light Garden’, an interactive light and video installation for children aged 18 months to 5 years old. As we were ushered into the theatre space, each little person present was handed a mini torch, and we were met by a grown woman with antennae, spotty ladybird pattern shorts and t-shirt, and stripy knee high socks. And I knew this was going to be no ordinary show…..
Our guide led us into the semi-darkness with the torches to light our way, and the first stop was a makeshift hillside (well, cushions, but after a few minutes of being part of this interactive world, you soon stopped seeing things for what they were!) where a series of light-projected ladybirds scurried around. Through a series of gestures and mime, our guide encouraged the toddlers to ‘catch’ them as made an appearance. Slowly but surely, our guide made sure that no area was left undiscovered, as she skipped and danced around the floor, enticing the children to follow her and explore this strange yet safe feeling new environment. There were pools of water projected onto the floor with fish to catch, illuminated switches that controlled the sound of the weather, lights that projected your shadow hugely onto the wall, tents and a ‘campfire’ to play in and with, and a magical cave where we were encouraged to make light drawings with our torches. These glowing images that remained visible long after the torch had been taken away brought a look of amazement to my daughters face, and I stopped trying to figure out how it was done and just tried to immerse myself in the experience as you could clearly see all the little people were doing so easily. My only criticism of ‘The Light Garden’ was that is felt too short at only 20 minutes long. Although it was quite gentle, it took a while for most of the children to warm up. For the first ten minutes, my daughter was fine, but was a little anxious if she couldn’t see me right by her. By the end, she had forgotten I was there as she climbed in and out of tents with lights projected in them, chased our guide and her shadow around the room and threw herself at piles of cushions to catch the bugs. She was just warmed up nicely, and then it was over. However, overall this was a brilliant introduction to theatre for the very young, and we will be sure to be back at The Tobacco Factory soon to see what else is on offer.